kc bob: Lowering Medicare Eligibility to 60? 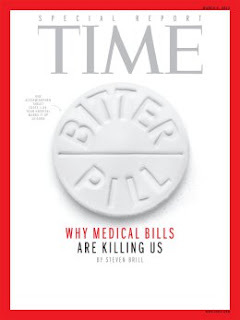 BRILL: Well, if you put Medicare in the context of the larger health care system, and this is something that everybody at this table is going to think that I should go to a mental hospital when I get finished saying this, the government and all of us would actually save money if you lowered — I said lowered the age for Medicare. If the Medicare age were 60 instead of 65, the economy and the taxpayers would actually save money. And George, please don't look at me like that. RATTNER: You're potentially right. And part of the argument — you're taking people out of the Medicare age to 67 is you're taking people out of the Medicare system. BRILL: Right. And what you would be doing, is you would be putting the most efficient player, which is Medicare — Medicare spends 80 or 90 cents to process a claim and the health insurance companies spend $18 or $20 or $25 to process a claim. Health insurance companies pay two, three, four times what Medicare pays for various services. So if you lowered the age, you would put more people into the bucket of much more efficient health care. Hard to argue with the logic. Especially for folks who think that Medicare holds down the type of costs that Brill writes about in his Time article. Even so, many folks would see it as a government power grab and liken it to a single payer system. What do you think should be done to help Medicare? I thought this Time article was a fantastic article. When they were messing with Obamacare, I always thought it would be more logical to lower the age to qualify for Medicare. I thought that too Joe. Not sure why they could not have given it a try. Hope you are well. Have a great weekend! I'm a proponent of the single payer system for a number of reasons. Here are just two. It's the only way to provide health care for everyone. Health care should not be provided by employers whose primary goal is not healthcare; it does not serve everyone equally, it is not administered by health care experts, the cost to the smaller employer is higher, which is a competitive disadvantage that is unrelated to the company's product or service. When a government program only serves part of the population, the other part of the population sees it as an unearned handout and resents it. If everyone's health care cost is covered by the government, it can be seen as a right of citizenship rather than a benefit to the poor and a burden to everyone else. When I qualified for Medicare, I was shocked by how little Medicare pays the providers. We shouldn't make Medicare financially sound by paying health care providers less than their cost. The providers will be forced to either refuse service to Medicare patients or raise the cost of their services to non-Medicare customers. Lowering the Medicare minimum age saves money only because it increases the burden on health care providers. I believe that non-Medicare customers are overcharged by their providers but it is unrealistic to expect that providers can stay in business when they are not allowed to offset their Medicare losses from their non-Medicare customers. If we want Medicare and Social Security to survive the taxpayer has to contribute more. Money can be raised by increasing the income limit above which Social Security is not paid. But, more money can and should, in my opinion, be raised by increasing the payroll tax rate on both the employer and the employee. The worst things we can do to extend these programs is to privatize them or to decrease the benefits. Privatizing them will add more private sector overhead and profit. Privatized Social Security would be no more effective than 401k as a safeguard against poverty for the elderly and disabled. Great thoughts Joe. I agree entirely with what you have written here. I especially agree with your perspective on paying providers less than their costs.